Printable word searches come in just about any theme you want, and if you don't find the right one you can even make one. They may even help improve thinking skills all in television-free afternoon. Below are three different themes for word searches: space, beach and breakfast. To print, click on the image to open the PDF file in another tab. Then click on the print icon to print the word search at home. 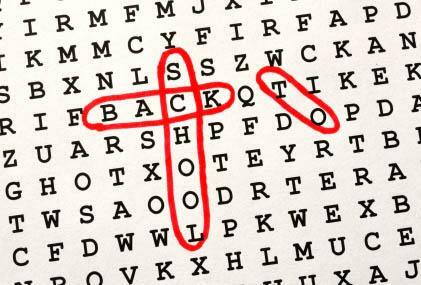 If you need help downloading the word searches, check out these helpful tips. 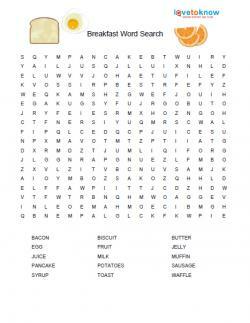 Click to print this breakfast word search. 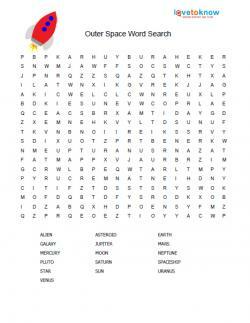 Click to print this outer space word search. 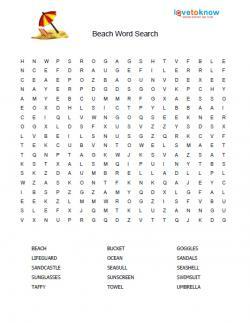 Click to print this beach word search. Puzzle Choice has lots of word searches you can choose by clicking on a theme. Themes include shoes, cats, weather, and more. While most of the word searches are printable, there is also the option to use some of them interactively online. Jump into spring with these themed word searches from LoveToKnow. Celebrate harvest with these great Thanksgiving word searches. If you're feeling creative, you can also make word searches using your word processor or writing them out by hand. Make them more educational by using scientific terms or other words that may need to be looked up in the dictionary. You can even have kids write their own simple searches based on topics of interest to them.